Guaranteed gaming rewards are conveniently located on the ground floor of the Tingalpa Hotel. The entrance is directly through the back of the hotel. Sufficient free parking is offered for patrons comfort. Tingalpa hotel’s gaming lounge was designing with a modern and relaxing ambience. Offering a variety of state of the art electronic machines including Lightning Link, Dragon Link and Lock It Link machines. Daily and major gaming jackpots and promotions. TITO system allows ease of payment, popular Keno, ATM & EFTPOS facilities all located closed by. A serviced bar and lounge are easily accessible and at your disposal with an extensive range of craft beer & premium spirits available. 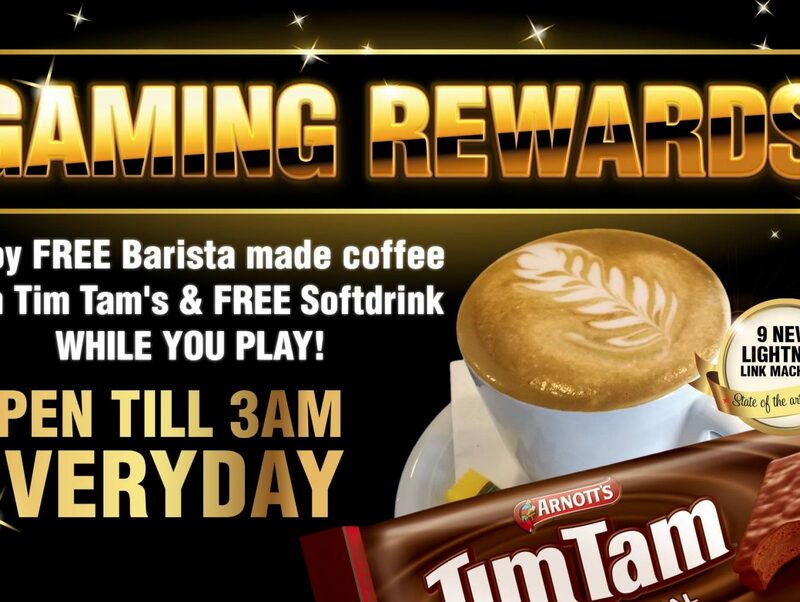 Tingalpa Hotel gaming room offers patrons’ complimentary BARISTA MADE COFFEE with a free TIM TAM. For those of you who don’t know what a Tim Tam is it is an irresistible combination of crispy biscuit with a smooth centre and smothered in thick chocolate. Complimentary SOFT DRINKS and water are available upon request, encouraging patrons to take breaks from machines. We also offer free POPCORN, PLATTERS, CHEESE & CRACKERS. Now OPEN 7 days ’til 03:00am GUARANTEED! We are very passionate about responsible gaming. Guidelines enforced providing the best possible experience.